Socks are the hardest. For a future washing machine that washes, dries and then folds the results, it's one of the small barriers that remains in that latter stage. But as a research project that started back in 2008, Laundroid is finally getting there. Next year, the collaboration between housing firm Daiwa House, electronics company Panasonic and Seven Dreamers will start offering preorders, the year after that 'beta' machines, then folding machines for big institutions, with event full retail planned the year after that -- we'll be in 2019 by then. (That said, the all-in-one model is still at the in-development stage). There's no price and the presentation we saw added in a bunch of mosaic filtering on top as the shirt gradually got folded so you couldn't see how the thing actually works. But that's okay. We can wait. It's not going to stop us waiting our chore-dodging dreams to come true. Because clothing is so malleable, it takes a higher degree of skill and dexterity for a robot to perform tasks with than, say, wood or metal. Because clothing is so malleable, it takes a higher degree of skill and dexterity for a robot to perform tasks with than, say, wood or metal. However, as far as the on-the-rails demonstration on stage went, it was a success. A handful of minutes later, the HAL-esque cabinet (which frustratingly hid all the robotic 'magic') produced the shirt, folded flat, if not completely pristinely. (We're sticklers for crisp edges, what can we say?) The team behind it promises that more will be revealed as it slowly comes into existence over the end half of this decade. 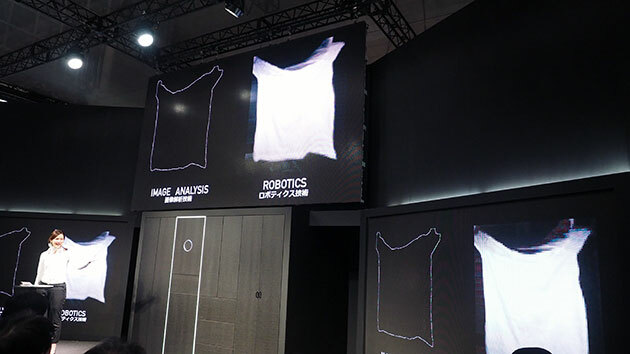 With a entire laundry load, the on-stage hostess explained it would likely take around seven hours, ideally meaning you'd set the machine to work as you're going to bed, waking up to pile of freshly, robotically, folded laundry. And for now, crumpled socks.